The UIS FIRST Robotics Team has a new location! 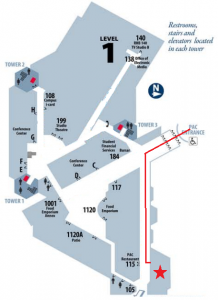 We are now located in the lower level of the Public Affairs Center on the UIS Campus. The easiest route is to head in the main entrance of the building (located at the tear-drop drive up) and turn left once through the sets of double doors. Our room is on the left-hand side of this hallway about 200 feet down. © 2019 4156 The Ninjaneers. Built using WordPress and OnePage Express Theme.